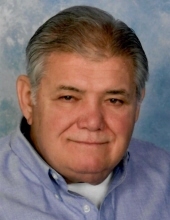 George D. Clementz, age 76, of Oswego, IL, passed away on Friday, April 5, 2019 at Rush-Copley Medical Center in Aurora, IL. He was born December 2, 1942, in Aurora, IL, the son of the late George William and Dorothy nee Kramer Clementz. George was a member of the Class of 1960 of Marmion Military Academy. He was an electrical contractor (Aurora Wiring & Fixture Co) in the Aurora land area. He was a member of the IBEW Local #461, St. Anne Catholic Church in Oswego, IL since 1973 and active in the K of C in Oswego, IL. He was also a member of the Phoenix Club and many other clubs in Aurora, IL. He is survived by his wife Joy nee Ferguson Clementz, grown children Cynthia Clementz, Dana Clementz, Cara (Bill) Schmidt, Jorie (Jason) Aloisio, Annemarie (Tom) LaGrassa, Lauren Clementz-Urbina, fourteen grandchildren, four great grandchildren, three sisters Mary (Richard) Gardner, Sarah (Norb) Weber, Martha Lage, six brothers Peter (Toni), Gregory (Denise), Samuel (Barb), Patrick (Dianne), Michael (Lynda), Christopher (Jean) Clementz, two sisters-in-law Gayle Danielson, Mary Ferguson, also several nieces and nephews. He was preceded in death by his parents George and Dorothy Clementz, grandson Bryce Alan Clementz, sister Laura Knuth, brother Mark Clementz, brothers-in-law Greg Lage, Gerry Knuth, in-laws Edgar and Eugenia Ferguson and nephew Daniel Lage. Mass of Christian Burial will be celebrated on Wednesday, April 10, 2019 at 10:00 AM at St Anne Catholic Church, 551 Boulder Hill Pass, Oswego, IL. Cremation was accorded the wishes of the family. Arrangements are entrusted to DUNN FAMILY FUNERAL HOME with CREMATORY, 1801 S. Douglas Road, Oswego, IL 60543. To send flowers or a remembrance gift to the family of George D. Clementz, please visit our Tribute Store. "Email Address" would like to share the life celebration of George D. Clementz. Click on the "link" to go to share a favorite memory or leave a condolence message for the family.